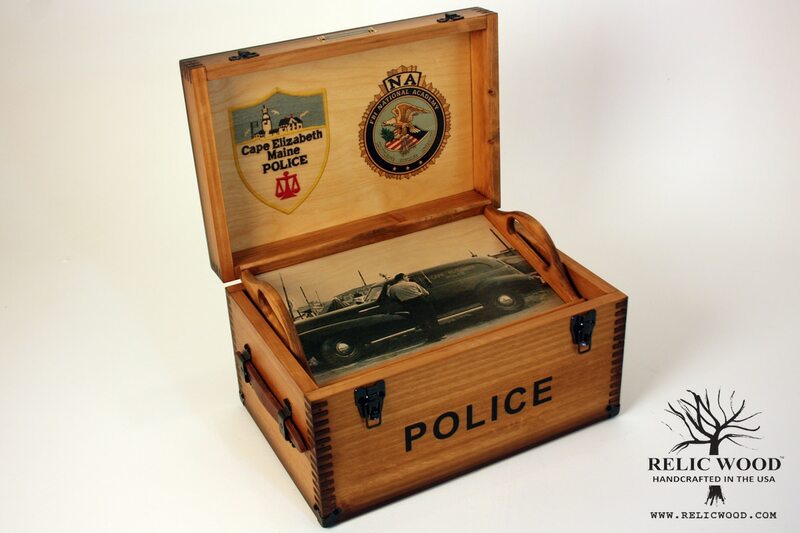 Custom Thin Line Keepsake Box – Customized specifically for your organization or department. Those who put their life out into the world to help and support the well being of others because it’s their calling, WE THANK YOU. Includes: Custom Lid Top Artwork (upload your badge or patch), and your organization name on the front. Additional Options: Artwork on the Inside Tray, Inside Lid, and Inside Bottom, Felt Shadowbox, Coin Holder, US Flag Holder, Brass Nameplate, and Brass Plaque. 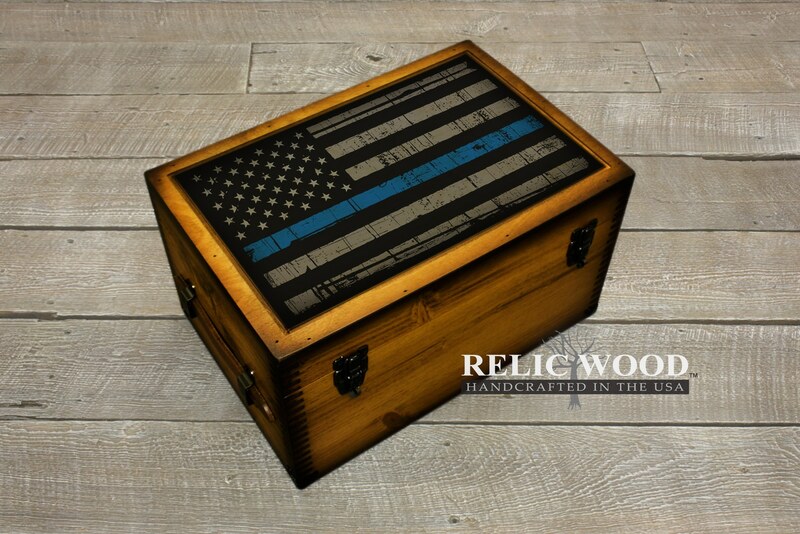 Our Custom Thin Line Keepsake Box Collection has 3 flag design options and 7 color options to choose from. Thin Blue Line – Police, Sheriff, State Hwy Patrol, etc. Thin Green Line – Federal Agents such as Border Patrol, Park Rangers, Game Wardens, Conservation Personnel, and some consider it for Military. 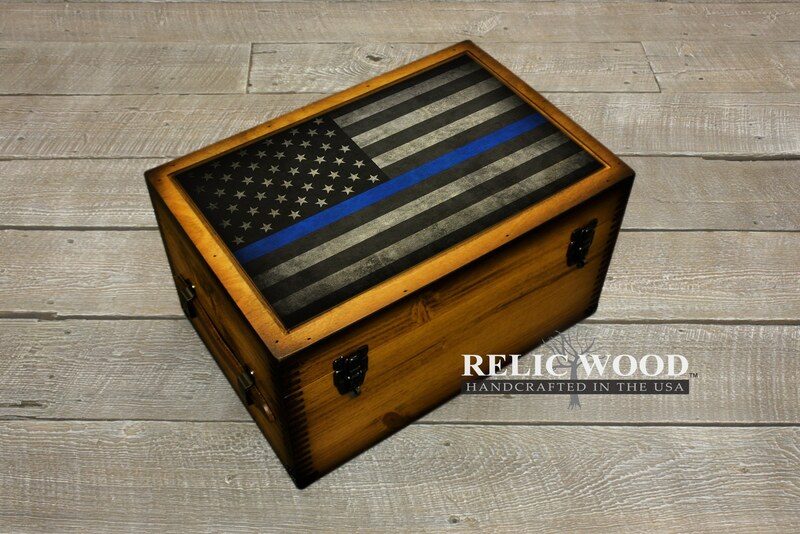 Included in the price is your organization’s Badge or Patch over the thin line flag on the lid top of the box. High resolution .jpg .pdf .ai. .eps file format. If don’t have the artwork, take a picture straight-on with a smartphone. Add your Department or Organization name here. Please enter text and double check your spelling . . . We create the design exactly from the text you enter. We will size the font to fit. If you would like to customize artwork in additional locations, please upload one artwork file or a placeholder file everywhere you want custom artwork. ** Once your order has been placed, you will be able to upload any additional artwork files inside your project manager area. Don’t worry :) We have actual US based HUMAN graphic designers on staff and your final artwork approval is required before we actually put your box into production. It is very important that you send us clear quality artwork for best results. We allow up to 5 different pieces of art in one location. There will be an additional charge of 19.95 per 5 items in one location. Holds a standard 3×5 US Flag. Removable Plexiglass Cover. Flag holder is mounted to the inside bottom of the box below the tray. Optional Brass Plaque can contain flag flown info or custom message. Choose one size. Put this brass plaque on the inside tray or inside lid to compliment your custom artwork or shadowbox. Perfect for poems, quotes, & personal messages, etc. 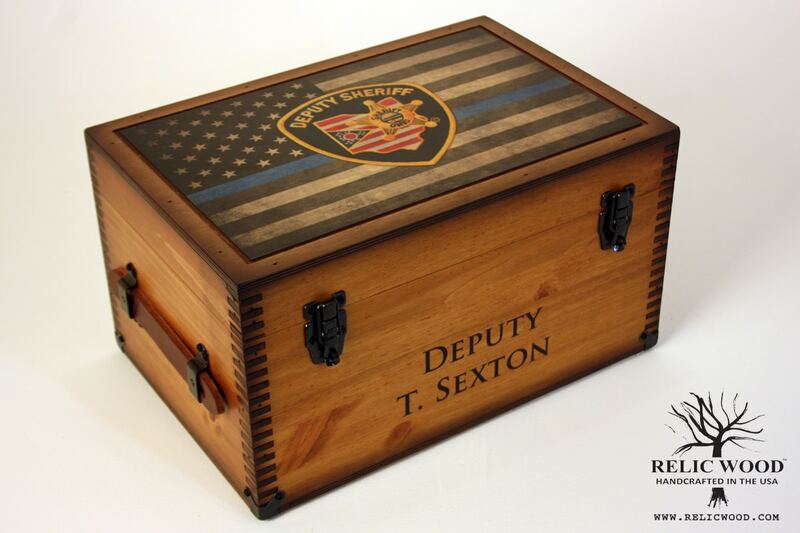 Custom Thin Line Keepsake Box – A perfect gift customized specifically for your organization or department. Those who put their life out into the world to help and support the well being of others because it’s their calling, WE THANK YOU. 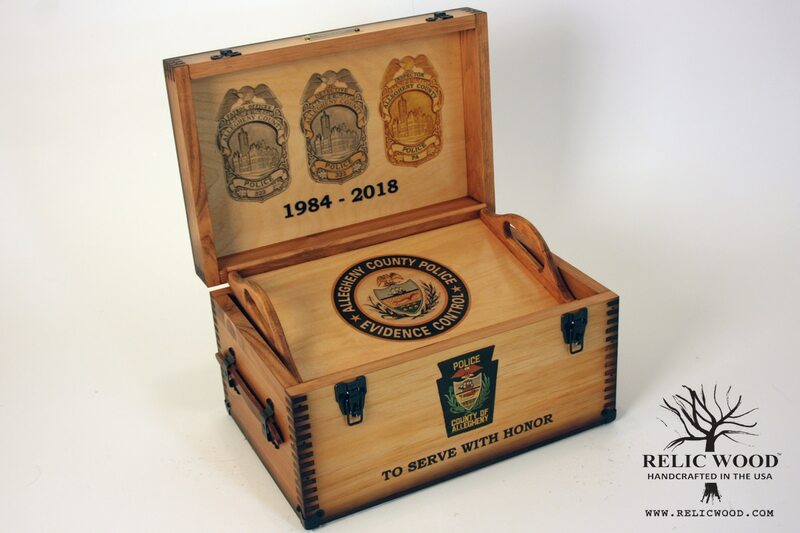 A great way to thank the service man or women in your life by gifting this handmade Thin Line Keepsake box as they gift you with their goal to serve and protect your well being. Thin Blue Line – There are several meaning behind the Thin Blue Line. The Thin Blue Line represents police officers who put themselves between danger, good and evil, and a memorial for those officers to lost their lives and those who continue to serve. 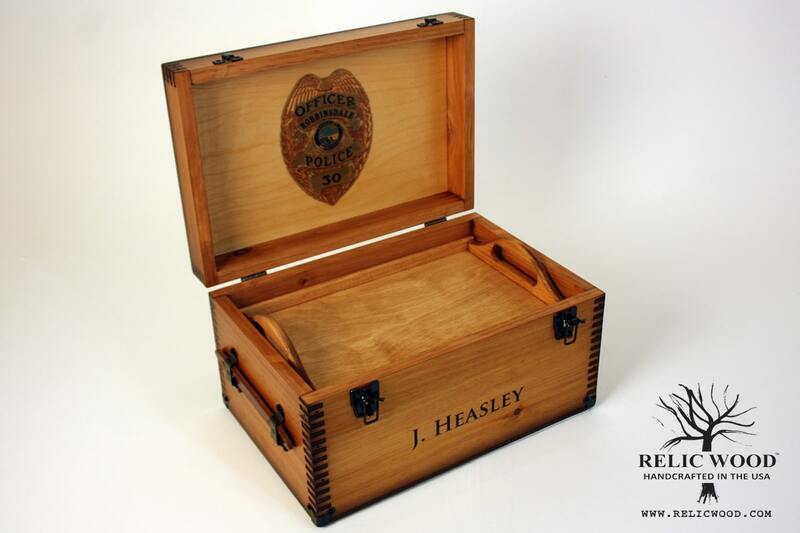 What a great way to show how much you appreciate the police officer in your life with a custom keepsake box gift. Used for Law Enforcement Police, Sheriff, State Hwy Patrol, etc. Thin Red Line – “Thin Red Line of Courage” Fire Department faces fear and has to gather the last ounce of courage to save, protect life and property. Thin White Line – The Thin White Line with Blue background is used by EMS, EMT, Paramedic. Thin Silver/Grey Line – Correctional Officers, Fugitive Recovery Agents, Bail Bonds Officers, Bounty Hunters. Thin Green Line – Federal Agents such as Border Patrol, Park Rangers, Game Wardens, Conservation Personel, and some consider it for Military. Security Guards have adopted the Thin Green Line. Thin Orange Line – Search and Rescue, sometimes EMS, and Concealed carry weapon permit. Thin Yellow/Gold Line – Dispatchers, Security Guards, Loss Preventions and Tow Truck Drivers. All photos are examples of custom orders completed and may vary from what is included in the price.